Seen from a few floors up in downtown San Diego. 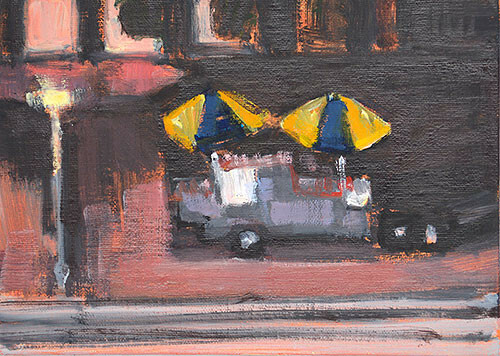 This entry was posted in Landscape Paintings, San Diego Paintings, Urban Landscapes and tagged 5 x 7 inches, california, hot dog stand, night, oil on linen on panel, san diego, umbrella on June 8, 2016 by Kevin. 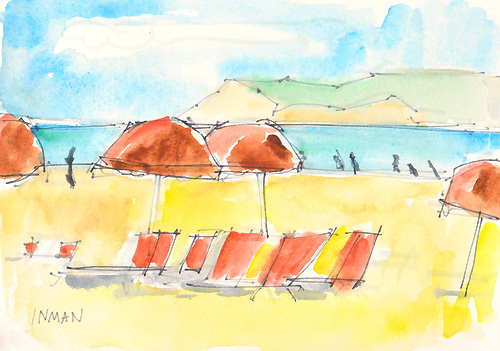 This entry was posted in Landscape Paintings, San Diego Paintings, Seascape Paintings and tagged 5 x 7 inches, beach, beach chairs, coronado, hotel del, landscape, point loma, umbrella, watercolor on June 22, 2014 by Kevin.